Couple interesting stories in the news lately. One was about the discovery of gravitational waves. 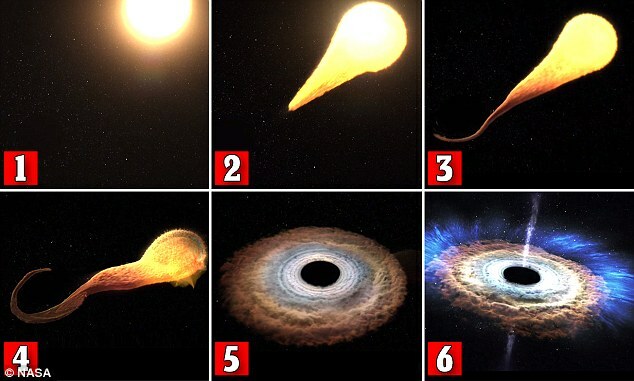 The other was about directly witnessing a star get swallowed by a black hole. Here, let’s take the REALLY interesting part of this diagram. Shouldn’t the star be getting sucked directly into the black hole? If the black hole has such all-powerful gravity, shouldn’t the star’s mass be getting pulled right along the blue line, right into the center of the black hole? What’s it doing curving AWAY from it, like with the red line? When was the last time you saw an object fall and turn AWAY like this? For this, we need to get into the deeper workings of Einstein’s theory of general relativity – the idea that space is curved, and all we can ever see as observers is a flattened version of it. Not far behind is the mystery of black holes, those unknowable holes of nothingness, those Bermuda Triangles of the universe, and ultimate examples of relativity in action. To better understand the relativity of black holes, we must understand the concept of curvature of space. 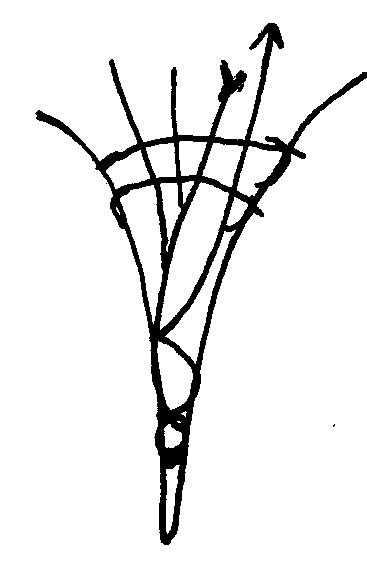 This is the branch of mathematics known as non-Euclidean geometry, and we’ve all seen it at one point or another. Take, for example, an intercontinental flight. Watch your flight take place on a map, and your plane seems to curve along its way to the target, rather than going in a straight line. That seems a bit … inefficient. 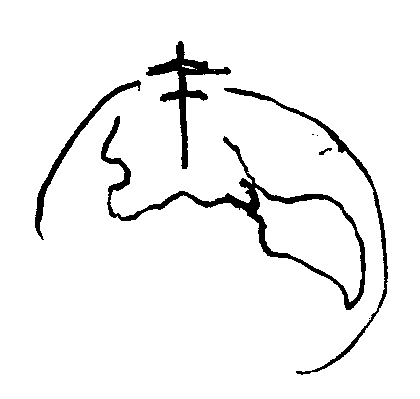 Until you recall that we’re not travelling on a map, we’re travelling on the surface of a sphere. We and the pilot are very nicely travelling along a straight line, never veering to the left or right as the map would have us believe. Likewise, light always travels straight, unperturbed by gravity since it has no mass. So why does it bend in a gravitational field? This is where Einstein’s theory comes in. He said that gravity is more accurately understood as a warping of space and time (spacetime), and that a massless beam is still travelling straight through the field. 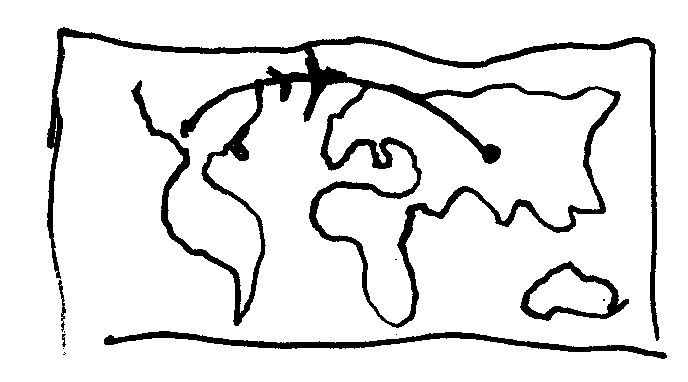 Much like if, instead of traversing a globe, our plane were to fly through a depression or whirlpool without turning. It would also bend its path even though we were flying perfectly straight. So here’s the issue, mathematically speaking. If a straight line goes through any whirlpool, no matter how steep, it will spiral in, level out, and eventually spiral its way out. If a black hole simply has really, really steep walls, light will be able to escape. There would be no such thing as an event horizon, through which light can never escape. From a mathematical perspective, the only shape that can hold a straight line is a cylinder. And that’s how we would need to understand the topology of a black hole – not that it is just really really steep, but that it’s more like a well – with walls asymptoting (limiting themselves) at the event horizon. Which brings us to an interesting concept. “Light can’t escape a black hole” is actually a misnomer. Fact is, light can never ENTER a black hole. By our idea of the asymptotic well, light will always spiral in ad infinitum. 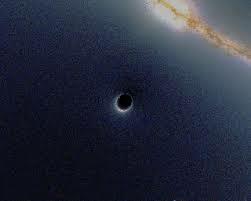 We can see evidence of this in the picture below of a black hole crossing over a galaxy. That corona around it? That’s light from the galaxy hitting the black hole, spiraling into its well, before spiraling back out in that ring formation. And let’s take that the actual mass of a black hole is a infinitesimal speck right in the middle of the event horizon. What we’re seeing already is a black hole is literally a RUPTURE in spacetime. By this model, there is no spacetime between the black hole and the event horizon. The “corona” around this black hole is light from the nearby galaxy that gets trapped in its pull. It then spirals in, flattens out at a certain depth, and spirals back out at us. This is where things start to get weird. To better understand this weirdness, we need to understand just HOW spacetime warps around a black hole. First of all, the “speed of light” is a misnomer. There is no universal “maximum speed” per se. It may take four years for light to reach here from Alpha Centauri. But that’s from the perspective of us sitting here on Earth. If you were somehow to hitch a ride on a beam of light, you’d arrive at Alpha Centauri in an instant. It’s only to all your friends back home that it seemed to take you four years (eight years, really, since it would take four more years for news of your arrival to hit home). If you were to somehow speed up that quickly, and slow down again, what you’d see is the whole universe collapsing all around you, Alpha Centauri would only seem a step away, you’d make a quick jump, and then the universe would expand again as you slowed down, finding yourself at your new star in just a moment. Meanwhile, everything around you just aged four years. Cool, huh? Of course we haven’t even gotten to the fact that you’d have to accelerate far faster than the speed of light to get anywhere near it – meaning, if you had some gyroscopic speedometer that was based purely on acceleration, it would say you’re going far far faster than light speed. But let’s save that for another time. Here’s a more realistic application – the Cern supercollider, which accelerates particles to near the speed of light. It runs them along a magnetic circular track, accelerating them to near the speed of light. 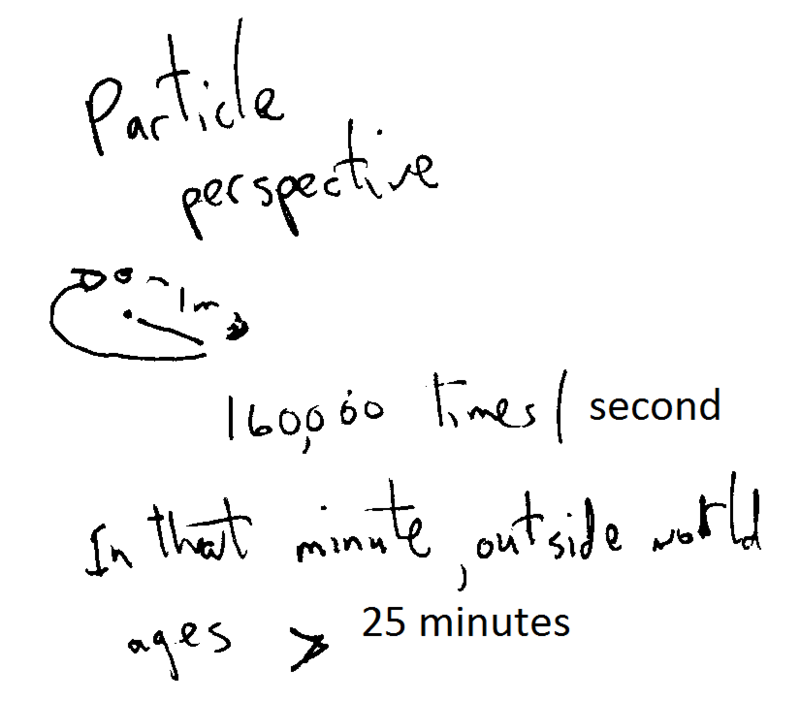 What happens from an observer’s perspective is far different from the particle’s perspective. For simplicity’s sake, let’s say the track has a radius of 1 mile. It accelerates to near the speed of light, running round it at 100 times/second. But let’s say we could shrink down to that particle level and hitch a ride. What would we experience? As we approached the speed of light, time would slow down for us, AND distances would shrink. Other things would happen too, like we’d become more massive. But the distance and the time are the interesting part. 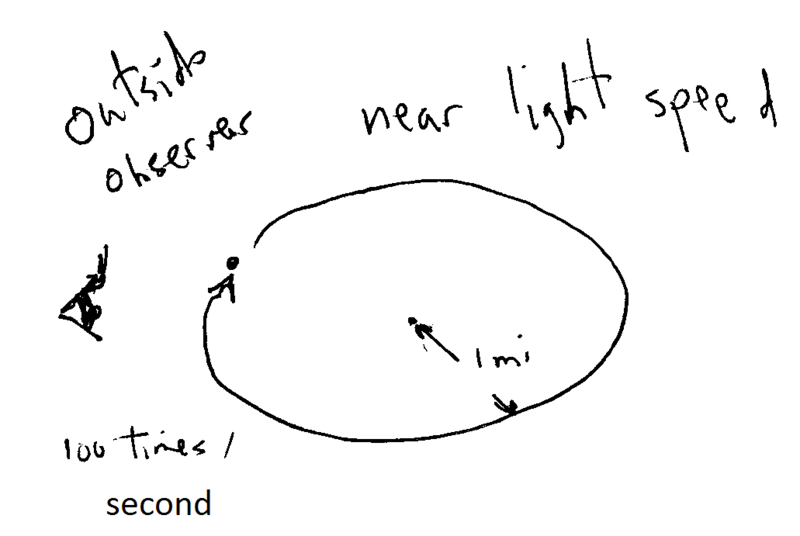 Our track would shrink to only 1 meter radius, and now while we were at around the same near-light speed the observer sees us at, we’re now doing the track at 160 THOUSAND times/second. In that second, we’d see the outside world age 25 minutes. Okay, now back to black holes. One fascinating phenomenon about matter entering black holes is, for a while it seems to turn AWAY from the black hole. As if the black hole wants matter to orbit around it rather than sucking it right in. How can that even happen? Once again, this is an illusion brought by travel along non-Euclidean spacetime. 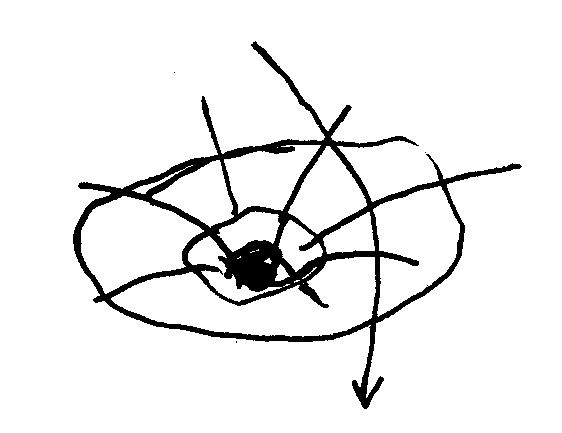 Let’s go back to our diagram of a black hole as a well. Better yet, let’s look down an actual well. 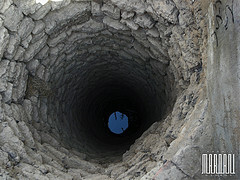 Now, imagine this well is really deep. I mean, really REALLY deep. See that disk at the bottom? How small can you imagine it? And remember, it’s the exact same diameter at the bottom as it is at the top. Now, try shining a laser pointer at the bottom of this really deep well. Not too easy, is it? You’ll inevitably end up hitting the surrounding wall. And that’s what happens when matter or light hits a black hole. Let’s take what we learned from our Cern particle and see what happens as matter hits a black hole. From an observer’s perspective, it approaches, then mysteriously turns away as it accelerates and starts orbiting the black hole. But what happens from the particle’s perspective, as it hurtles towards that black hole at breakneck speed, powerful gravitational forces accelerating it near the speed of light? We go back to our Cern illustration. As it accelerates, its universe collapses around it. Rather than curving away from the hole, the very black hole it seems to be hurtling into shys away from it. It continues ever towards it, missing this now shrunken black hole. Since it can never aim for absolute dead center, the black hole will always shy away just enough to have it “miss” and gett pulled into orbit instead. Keep in mind it’s the same black hole, it’s still travelling a similar near-light speed, but it orbits this shrunken black hole 1000 times in the time it takes the observer to see it orbit the black hole once. That infinitesimal dot at the bottom of our well is starting to make a lot more sense now, doesn’t it? Also, it’s a nice location for the Restaurant at the End of the Universe. But we digress. So, here’s where things get REALLY interesting. If the event horizon is the circumference at which light can no longer escape – it means from the perspective of anything on the event horizon, that black hole is now infinitesimal in size. Which just happens to be the perfect distance for quantum mechanics. Now, I’m not much of a quantum mechanist. I know enough about the subject to separate science from new age bunk, but that’s about it. But as a mathematician and armchair philosopher, I also know about Zeno’s paradox: That nothing can ever get from point A to point B. That’s because it has to travel half that distance first, and half that distance before that, and so on ad infinitum. The solution to that paradox is also the prediction of the atom – that ultimately the universe is composed of indivisible quanta. And that’s what I think is happening between the event horizon and the point of singularity. The concept of spacetime in here is bunk. It’s a hole in spacetime. An infinitesimal hole, a quantum leap between the event horizon and the point of singularity. And particles snap to singularity. 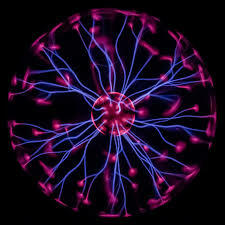 Kinda something like this plasma globe. So let’s go back to our black hole eating the star. What’s happening? As the star’s matter approaches the black hole, it’s getting accelerated to speeds approaching light. To them, they’re going straight into it. But the black hole is shrinking. While we’re watching them slowly orbit around it, they’re orbiting it at fractions of an instant. As friction eats away at their orbit and they get nearer and nearer the “event horizon” it keeps shrinking farther and farther away from them until they get shredded into the light show you see above. People are fascinated with the event horizon. More so, they’re obsessed with CROSSING it. What’s on the other side? We now see that simply APPROACHING the event horizon gives us plenty of questions to answer before we throw a probe into a black hole and hope it doesn’t fall apart. The fun thing about black holes is they’re such a drastic warp of spacetime that they render our very flattened perception of them meaningless. For example, the more massive a black hole is, the smaller its apparent gravity at the event horizon. There are some black holes so massive that, as far as we can tell, gravity at the event horizon is less than gravity at the earth’s surface. That doesn’t make any sense, does it? If you could hang out like this at the event horizon with some rocket thrusters, it would be very easy to throw a depth charge through the horizon, watch it explode, and witness the event via the light that crosses through the horizon. Except you just contradicted the whole concept of an event horizon. Something’s wrong about our calculations. Ah yes – we forgot we’re not in flat space-time. It’s not just the faster you travel that the smaller everything gets. The more warped the spacetime you’re in, the smaller everything gets. It’s all the same phenomenon really. So even if you somehow managed to temper your descent into a black hole so you got to what you thought was the event horizon, instead you’d be seeing a smaller black hole. It’s not just an accurate portrayal of falling down a black hole … the downward spiral is a great literary device. Matter will always be accelerated towards a shrinking black hole until it reaches light speed, and the whole universe collapses around it to a timeless point. These are certainly things worth thinking about. 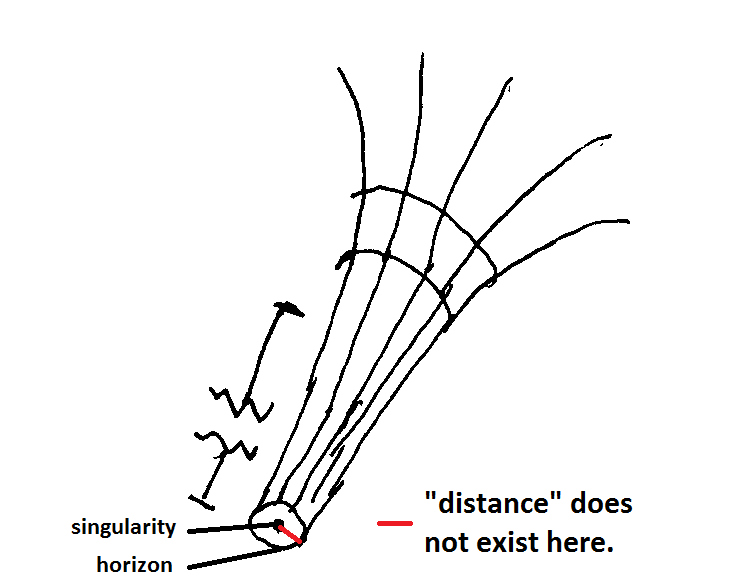 We have to remember, when we think about these things, that an event horizon is such a profound warp of space-time, we can’t just “hang out around the horizon” like sci-fi illustrations would have us believe. As we can see from the 3D diagrams, before we think of crossing the event horizon, we have to understand the profound differences of anything approaching it. Any matter we interact with it would either have to accelerate an orbit to nearly the speed of light, or experience gravitational force that would rip any matter to subatomic shreds. All this, within a space of millimeters by our outside perspective, that was somehow stretched to astronomical lengths invisible to our naïve eyes. This entry was posted in Politics on March 7, 2016 by Mr. Biggs.